Many of our friends and members have asked when we would offer on-line payments for membership and events registration. We are happy to announce that we have affiliated with PayPal to do so. PayPal is a large internet-based payment system used by individuals and merchants worldwide to handle securely payments and receipts over the web. The benefit for a non-profit organization like the Friends is that their system is relatively easy to integrate into our website, their fees are among the lowest and they have a proven, secure track record. No information about your credit card passes through or is stored (even for a moment) on the Friends' website. All credit card processing is done on PayPal's secure websites which implement the latest in anti-fraud and other security features. Lots more information is available on PayPal's website. How does it Work on the Friends' Website? Clicking on one of the buttons (one button for Members' pricing, the other for Non-members) adds that event to your own electronic shopping cart. Clicking on additional buttons to reserve your seat for additional events (if desired). Checking out, i.e., completion of the transaction by paying with your credit card. We will look at each of these steps in more detail, below. The events you have clicked on are detailed here. Each Event's price is shown. If you clicked the wrong button, you may remove the event by clicking "Remove." Also, if you changed the number in "Quantity", then click "Update." The extended price is shown (Price x Quantity). 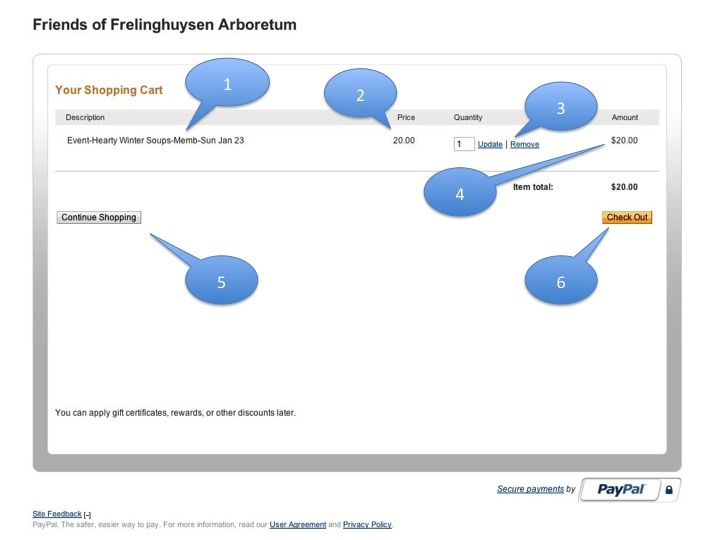 If you want to add more to your cart, you may click "Continue Shopping." If you are done and want to complete your purchase, click on "Check Out." Read more about this, below. Hopefully you will want to attend several more events. If you are still looking at your shopping cart, click on the "Continue Shopping" button. This will close the shopping cart and return you to the Events page. Click on the "Add to Cart" button of the next program you wish to attend. Your shopping cart will again appear, this time with a second event (or third or fourth -- don't hesitate!). You can repeat this cycle as often as you wish, adding registration after registration to your cart. The image at right illustrates a cart with two events. Note the separate descriptions and prices, together with the updated total. 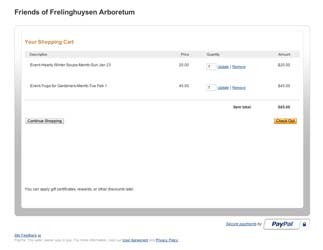 In your Shopping Cart, click on the "Checkout" button. 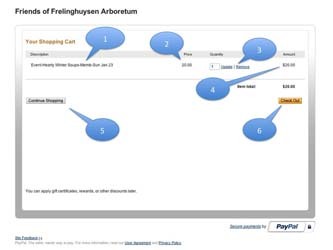 You will be taken to a secure PayPal checkout page similar to the image on the right. Can't find your shopping cart? Go to the top of the Events page and click on the "View Cart" button which will open your cart where you can click on the "Checkout" button. Note the order summary on the left. This should exactly match your shopping cart. On the right, there are two different payment methods, one for PayPal members (you know who you are and you probably do not need my help in handling your order. 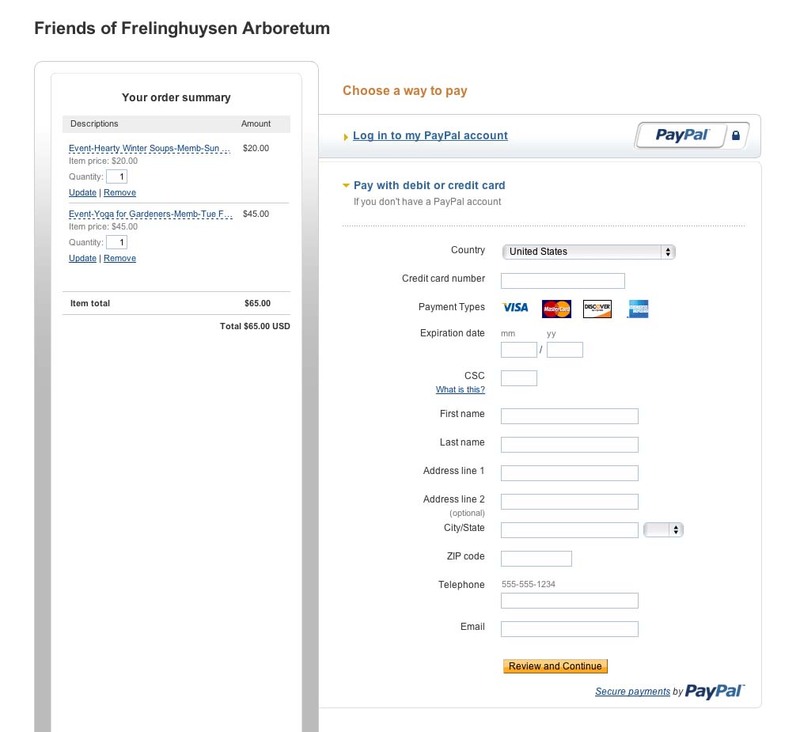 Membership in PayPal speeds up the checkout process by storing your information. This is not necessary for checkout) and the other for the rest of us. Let's focus on the section called, "Pay with debit or credit card (if you don't have a PayPal account)." Fill out all the sections -- your credit card number, expiry date, security code, name, address, etc. Please fill out the telephone number and email address -- these are important in case we have to contact you about the program. When complete, click on the "Review and Continue" button. On the next screen, you will get another chance to review your data. When you are satisfied, click on the button to complete the transaction. 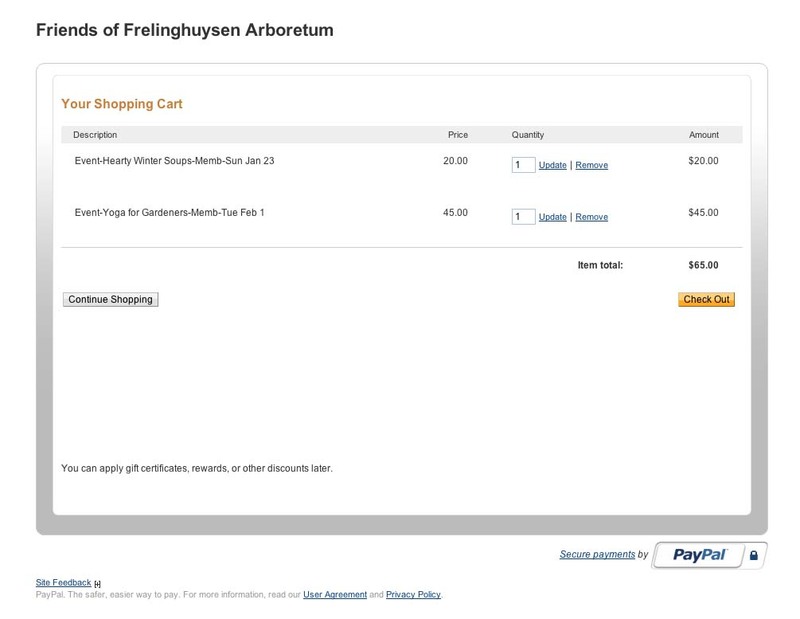 You will then see a confirmation screen from PayPal. 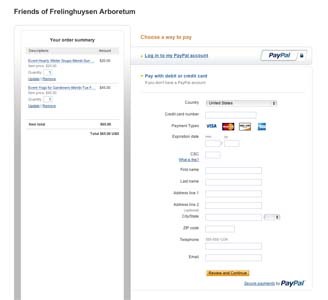 You will also receive a confirming email from PayPal and the Friends will receive notice of your registration. Please call the Arboretum (973-326-7603) for questions about programs.